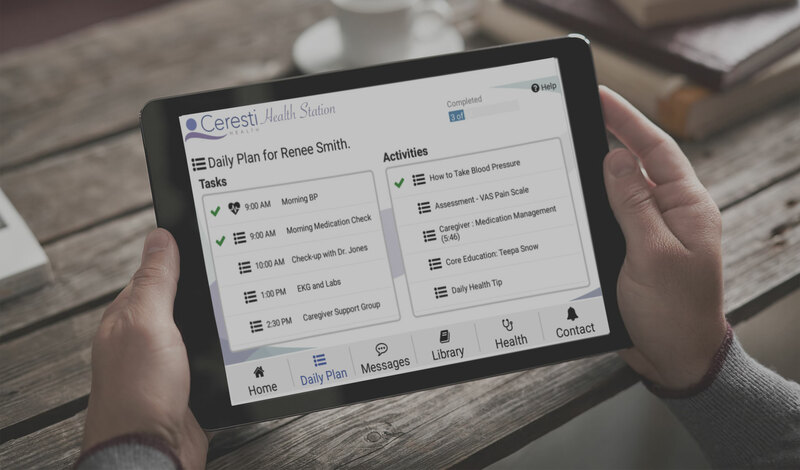 Ceresti Health – Enabling Family Caregivers. Improving Patient Health. Ceresti’s care coaching, education and support program makes it easier to navigate the challenges of being a family caregiver. Being a family caregiver can be overwhelming. This is particularly true if your loved one suffers from chronic conditions and has problems with memory, hearing, vision or mobility. Our care coaching, support and education program is specifically designed to support spouses, adult children and other family members to provide the best possible care for their loved one. We work with you to understand your unique caregiving challenges and develop a personalize program that is tailored to your needs. Your program includes videos, tutorials, access to support, tools for engaging your loved one, reminders, and connects you to other members of the care team. Access your program on a dedicated senior-friendly tablet computer that we send to your home. If you prefer, you can configure your mobile phone or tablet as a health station by installing our mobile App, or access your program on a computer using a web browser. We match you with a dedicated coach to guide your progress, remotely. Your Ceresti coach empowers you to provide the best possible care for your loved one by offering ongoing support and resources. Ceresti’s care coaching, education and support programs are offered by some providers and health plans (e.g. Medicare Advantage) at no cost to you. Programs may differ in content, duration and intensity based on Ceresti’s relationships with providers and health plans. Ceresti’s personalized program is also available in the U.S. on a private-pay basis. Please refer to our Program Brochure for additional information. If you have any questions about the suitability of Ceresti’s program for your needs please call us at (760) 453-0977.